Hakan Orbay, MD, PhD, Chris Little, BS, Brittany Busse, MD, Lee Lankford, MS, David E. Sahar, MD. UCDavis Medical Center, Sacramento, CA, USA. PURPOSE: Multiple protocols have been used in the past for differentiation of adipose-derived stem cells (ASCs) towards Schwann cells (SC) lineage with variety of growth factors. However the role of growth factors and chemokines in the differentiation medium are not well known. Our aim in this study is to define the importance of each component of a previously published ASCs-SC differentiation protocol. METHODS: ASCs were isolated from rat inguinal fat pads and characterized with fluorescence assisted cell sorting (FACS). Multilineage differentiation potency of ASCs was confirmed with adipogenic, osteogenic and chodrogenic differentiation. Cells in culture flasks were divided into 6 groups. Cells in control group were supplemented with cell growth medium. Cells in group I were treated with 1 mM β-mercaptoethanol for 24 hours and 35 ng/ml all-trans-retinoic acid for 72 hours. Subsequently, SC differentiation medium [cell growth medium supplemented with 5 ng/ml platelet-derived growth factor (PDGF), 10 ng/ml basic fibroblast growth factor (bFGF), 14 μM forskolin and 252 ng/ml glial growth factor (GGF)] was added into cell culture flasks. These components were removed from differentiation medium sequentially to detect the changes in gene expression profile of ASCs towards SC differentiation. In group II differentiation medium lacked GGF. Group III lacked forskolin, group IV lacked bFGF, and group V lacked PDGF in the differentiation medium. Cells were cultured for 2 weeks in all groups. Fresh medium was added every 72 hours. The fold changes in the expression levels of genes S100, integrinβ4, and NGFR were evaluated with qRT-PCR and immunofluorescence (IF) staining. RESULTS: Harvested ASCs were negative for CD31 and CD45, but positive for CD90. ASCs were successfully differentiated into adipogenic, osteogenic, and chodrogenic lineages as confirmed by oil O red, Alizarin red and Alcian blue staining respectively. Undifferentiated ASCs expressed a certain level of S100 gene but no integrinβ4 or NGFR. The highest expression of SC characterizing genes was observed in groups III and IV that lacked forskolin and bFGF respectively. 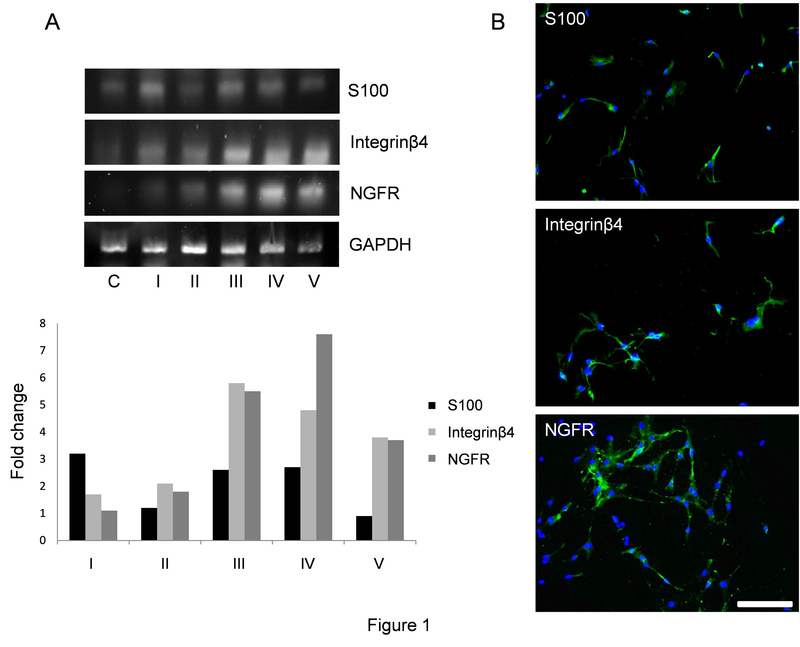 The cells treated with complete differentiation medium showed a 3.2 fold increase in the expression of S100 but the expression of integrinβ4 and NGFR was significantly lower in comparison to groups III and IV. Without GGF, cells did not express significant levels of SC characterizing genes as observed in group II. Overall the gene expression profile of cells from group IV was the most compatible with SC differentiation in comparison to other groups. Our results suggested that bFGF does not have a significant role in the differentiation of ASCs into SC. Moreover, GGF has a key role in SC differentiation process (Fig. 1A). IF staining yielded parallel results with qRT-PCR (Fig. 1B). CONCLUSION: Differentiation of ASCs into SC-like cells can be possible with a modified method utilizing a smaller number of growth factors. This study was the first step of a study to define a more clinically relevant and cost-effective SC differentiation protocol.